Chipotle is quite possibly one of the best restaurants out there. I love it, but since my vegan experiment back in the spring, I’ve been seeking out vegan options. Chipotle makes everything outside of their meat, sour cream, and cheese without any meat, dairy, or eggs. That means that everything on the menu that doesn’t include those three things is vegan. But earlier this year some Californian and Coloradan Chipotle stores did something radical. They added something to the menu. This really hasn’t happened since the first stores opened in Denver. But they did it. They added two menu items as an experiment: Vegetarian or vegan options of tempeh and tofu (sofritas). Now sofritas is going nation wide, and I’m pretty excited about this. 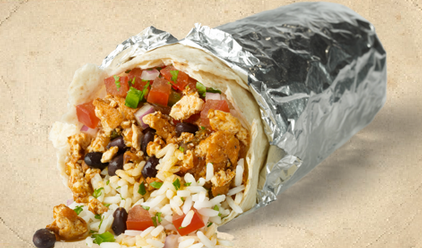 Yesterday, I picked up a vegan burrito from Chipotle, and the sofritas is the perfect texture and flavor. Tofu isn’t a normal staple in our house hold, but this beat the chicken in my palate. The texture isn’t really like ground beef, it’s more a tofu scramble texture. The flavor is smokey and a little spicy – although, if you can’t handle spicy I would recommend just going for a rice and bean burrito. It also drops the price of the burrito – a chicken burrito costs $8.50 and this runs $6.50. It would be worth it to pay an extra $2 in my book, but $6.50 for lunch makes it one of the cheapest lunches I can get anywhere and the most filling. At least one article says that the price isn’t acceptable to her, but since it was written, chipotle has either changed the price or she was charged incorrectly. I liked it, and I plan on making this a staple in my diet. Now Chipotle just needs to finish it’s store in Amarillo. It should be open by the end of the year or early 2015. This entry was posted in Uncategorized and tagged $6.50? !, Chipotle, Good value, Great flavor, Sofritas, Vegan, vegetarian. Bookmark the permalink. 4 Responses to Vegan Chipotle! Viva Sofritas! I know how you feel! I was in Colorado Springs when I posted this, and we still have another month or two before the Chipotle opens in Amarillo! Love the sofritas from Chipotle! Wonderful vegan option!